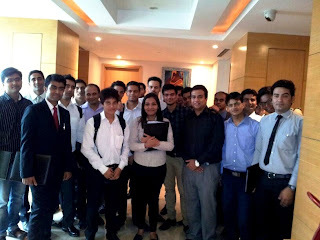 INLEAD facilitated an Industry Visit for International Hotel Management, July’13 batch students to the Radisson Blu, Gurgaon, a first class business segment hotel on 22nd July 2013. Radisson Blu, Gurgaon is an all-suite hotel comprising of 35 suites in 4 different categories. The Deluxe suite priced at 17500/- per night is the most expensive room in the category. The hotel has all day dinning called the TCK which stands for The Creative Kitchen; it’s an 85 cover restaurant which has a buffet for all 3 meals and also houses a live kitchen for all the a’ la carte orders. The other F&B options that a guest can choose from are the “The Cake Shop”, which is thepastry shop and “The Creative Lounge”. The lounge features karaoke nights every Friday and has an extensive list of whiskeys and cocktails and also serves light bites. This exposure helped the students in understanding the concept of corporate hotels and revenue management system. 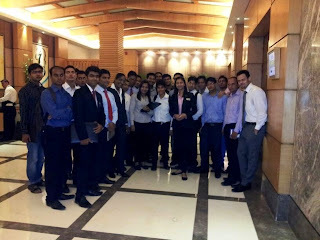 The visit also helped them in understanding the current market trends and industry expectations from young professionals. Excellent facilities with minimum budget.